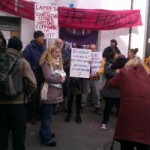 Pic from protest at Rectory Gardens in 2012. Rectory Gardens, a residential mews in Clapham Old Town, is being emptied, one household at a time. Henry, who has lived in the street since 1985, is among those waiting to be rehoused. When he leaves, Lambeth Council will probably hire Camelot, a ‘vacant property management’ company, to install ‘guardians’: people who pay the company for the privilege of staying in disused buildings and keeping out squatters. There are several property guardians already living on the street.